A walker was stretchered from a Lake District fell after injuring herself. The 55-year-old woman slipped in boggy ground on Lord’s Seat near Whinlatter Forest yesterday, and suffered a leg injury. Keswick Mountain Rescue Team was alerted about 11.50am. A member of the Patterdale Mountain Rescue Team, who was passing the site about 300m below the summit of the 552m (1,811ft) fell, used a bivvy shelter to keep the woman warm and the Keswick team was called out. A team spokesperson said: “As the weather was very wet and misty, the air ambulance was unable to attend. “The team was able to access the casualty site from a high point in Whinlatter Forest. 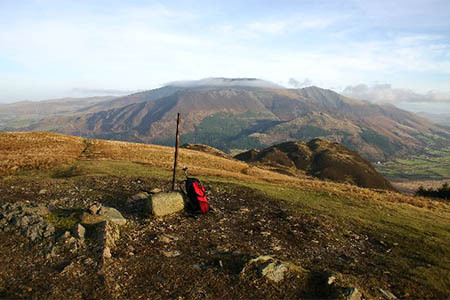 The two-hour rescue involved 19 Keswick MRT members. The team was alerted later that day after a couple got lost in mist between Glaramara’s summit and Allen Crags. Rescuers tried to pinpoint the walkers’ position using the Sarloc system, but could not do so because the mobile phone signal, which is needed to communicate with the walkers for the system to work, was patchy. The team spokesperson said: “While trying to establish their position, phone contact was lost, but a course of action was sent by text message.